The 2017 Saleen Mustang comes in three levels: the 400hp normally aspirated White Label, the 715hp supercharged Yellow Label and Black Label. Both the White and Yellow label comes with the Saleen 302 Styling Package, while the Black Label comes with the Saleen 302 Signature Series aerodynamics. Other features include Saleen suspension, Saleen wheels and breaks, Saleen interior, and badging. New for 2017 is the Saleen Championship Commemorative Edition. 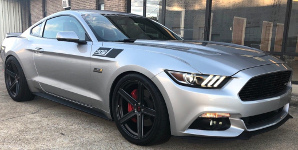 30 of these, 30 year anniversary of the SCCA championship wins, with a yellow, black, and white Saleen R.
This 2017 Ingot Silver Saleen Yellow Label has a 715 horsepower, 302 cubic inch, supercharged 5.0L V8, and Saleen 302 styling package. The 2017 Saleen starting price of the Yellow Label was $54,995. Those are 20 inch 5 spoke black Saleen wheels.